All our products are made from materials derived from hydrocarbons. They are not renewable or usefully biodegradable. Little is efficiently recyclable. Downstream processes such as dyeing and coating have a no less significant impact upon energy consumption and the environment. We don't have any answers to the environmental issues raised by our choice of materials. At this point in time, crux products would not achieve their respective performance levels with anything but oil-derivative fabrics. We can only hope for the imminent development of suitable new materials from non-hydrocarbon sources and using low energy-intensive manufacturing processes. Make our products functional and durable. Repair as much as we can. Recycle as much as we can. Warranty returns are re-sold or donated. Consume less. Don't buy or use anything we don't need. In practice, we recycle all the cartons in which the goods are originally shipped. We produce very little marketing material (hangtags only – we don't have point-of-sale materials or catalogues, for example). We do not commute: the vast majority of our product presentations are done at two annual trade shows (so our agents also spend little time on the road). We do not reinvent our products year in and year out (which entails needless designing, sampling, selling…). 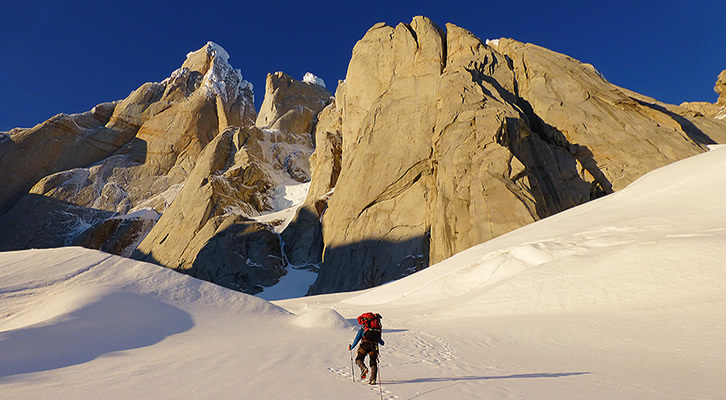 We applaud every effort made by our fabric and component suppliers, and the initiatives of brands such as Patagonia and Vaude. But the fact is every reduction in the impact we have on the environment is measurable only in small percentage terms and, whilst praiseworthy, should be for the benefit of the planet and not an excuse or justification for unnecessary consumption. The outdoor industry is not green.